Italian Oregano Thyme blooms in early spring just as the new growth from Marshall's Memory Oregano is emerging. The thyme is about 12 inches tall. It will bloom for about four weeks before shutting down. Once out of bloom, it is necessary to prune it back six or eight inches to encourage fresh useable growth. This will also make it tidier looking than if it is left alone to its own devices. Oregano Maru and Italian Oregano Thyme Honeyed Pork Chops combines zesty Italian Oregano Thyme with one of our most flavorful oreganos for an elegant entree. 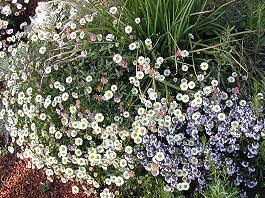 Lilac flowered Italian Oregano Thyme (on the right in the front) and Santa Barbara Daisy point out how beautiful a culinary herb can be. Italian Oregano Thyme makes a tasty addition to our Kitchen Herb Garden Six Pack and our Small Space Herb Garden Six Pack. This plant is often available in plug trays. These trays hold 128 of all the same plant. They are a great low cost way to fill a lot of space. Each cell is 3/4 of inch by an inch. Check here to see if Italian Oregano Thyme Plug Trays are available.